The home integrates the owner’s passions, drawing on their love of kayaking to organize the home’s plan. The kitchen, dining, living room, and main circulation spine pivot around a cedar-clad utility closet acting as a “rock in the stream,” mirroring the river obstacles the couple navigates. This sense of movement gives the plan energy and provides a buffer between the sheltered private spaces and the open public areas. 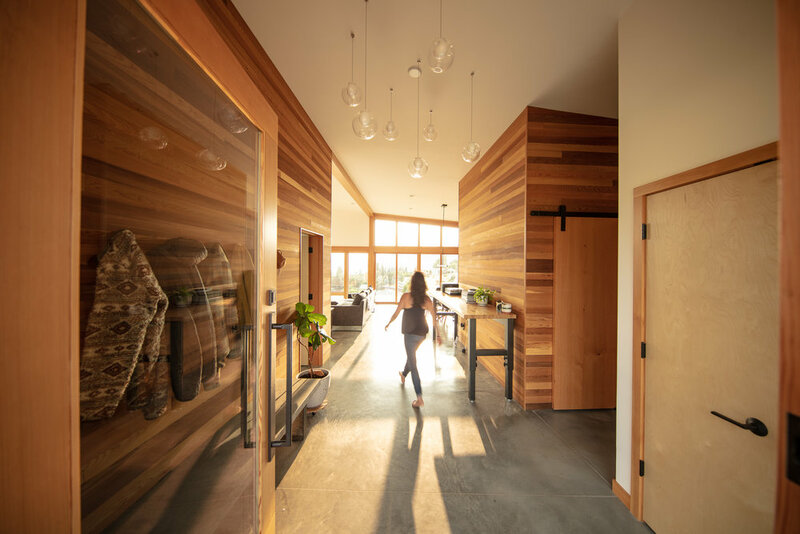 An east-entry courtyard defined by the house and garage provides shelter from the region’s famously fierce winds, orienting the home’s west side towards the commanding vista of the Columbia River as it winds through the gorge beneath the Cascade Range. With muted tones of rust, charcoal, and cedar, the house compliments the landscape, providing its owners with a home both lyrical and durable.